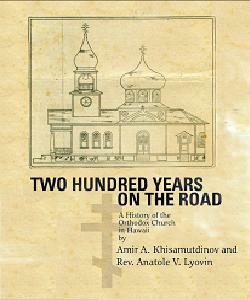 TWO HUNDRED YEARS ON THE ROAD: a History of the Orthodox Church in Hawaii by Amir A. Khisamutdinov and Rev. Anatole V. Lyovin is now available for purchase from Rev. Anatole Lyovin, the rector of the Holy Theotokos of Iveron Russian Orthodox Church in Honolulu, Hawaii. Cost per copy if ten or more are ordered: $18.00 (plus the actual cost of shipping). All orders should be sent to Father Anatole. Note that net proceeds from the sale of this book will be donated to our mission church. A second, color, edition is now in preparation. There will also be a Russian language version of this book which will be published in Russia but which will be also available for sale in the United States. This is a short history (88 pages) of the Orthodox Church in Hawaii, from very early sporadic and unorganized beginnings to later attempts to establish a viable and permanent Orthodox parish. The earliest Christian liturgy in the islands was most likely Russian Orthodox, although the earliest Christian burial was likely that of Captain Cook who was killed in the islands which predated the Orthodox service. Thanks to many visits of Russian ships to Hawaii there were many contacts between Hawaiians and Russian Orthodox believers, but only in the early 20th century there were serious attempts to establish permanent Orthodox parishes but it was not until late sixties of that century that such attempts finally bore fruit and Ss Constantine & Helen Greek Orthodox parish was established in Honolulu. Eventually, a group of parishioners of Ss Constantine & Helen left the Greek church and established a Russian Orthodox parish that gradually evolved into the present day Holy Theotokos of Iveron Russian Orthodox Church, also in Honolulu. The last part of the book emphasizes primarily the history and current state of the Russian Orthodox community although much attention is also given to the parish of Ss Constantine & Helen Greek Orthodox Cathedral of the Pacific. The book also discusses in some detail the appearance of the myrrh-streaming ‘Hawaiian’ Iveron icon of the Theotokos and the history of this icon and its various copies. The next priest in Hawaii was Fr Ioann (John) Dorosh about whom very little is known. It is known that he was of Carpatho-Russian origin and that he had graduated from the seminary of the Russian Orthodox Mission in Tenafly, New Jersey. After his arrival to Honolulu, he, like Fr Jacob Korchinsky before him, established good relations with Bishop Restarick. As his first order of business Fr Ioann continued the task of collecting money for the building of a church. Bishop Restarick and other local Americans tried their best to help the Russian immigrants organize a parish and build their own church. The bishop and plantation owners and other businessmen were very eager to have the Russian immigrants settle down in the islands. Fr Ioann, on his part, tried to interest the Russians in participating in local cultural and social activities. However, the latter did not feel the necessity to donate money for the building of a church and the priest’s salary. Not having either a church or even a local social organization of their own, these Russians more and more often expressed their desire to move to other places, for example, to California, or to return to Russia. The number of parishioners shrunk to such an extent that Fr Ioann, having lost all hope of establishing a viable parish and building a church, also left the Hawaiian Islands. 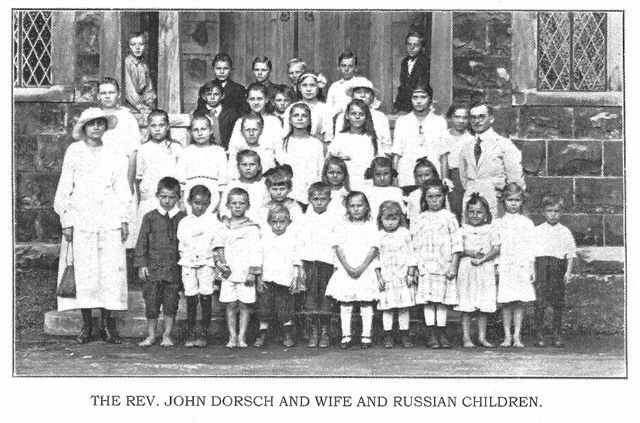 Newly ordained Fr John Dorosh, his matushka, and the Russian children of the Honolulu Parish, January 1917. (Note that Fr John is not wearing a cassock, not even a Roman collar!) The photo above is taken from Hawaiian Church Chronicle (Episcopal), January 1917 issue. Here we must make a rather lengthy citation from Bishop Restarick’s 1924 memoirs (pp 342-3) in which he describes the situation during Fr Ioann Dorosh’s attempt to establish a Russian Orthodox community in Hawaii. For several reasons Bishop Restarick’s report is rather surprising, especially his claim that the ruling Russian Orthodox Archbishop at that time asked him to take Fr Ioann under his jurisdiction, thus de facto recognizing the validity of the orders of the Episcopal Church, something that very likely had no precedent anywhere else! In November, 1916, I called on the Russian Archbishop in New York, and told him of the need for a priest to minister to the many Russians in Honolulu, who had been brought in the past few years to work on the plantations. I informed him that we had ministered to them when called upon for baptisms, marriages and burials, but that the people needed someone who could speak their own language and lead them in the worship to which they had become accustomed. On December 29, 1916, the Rev. John T. Dorosh, a priest of the Russian Church, arrived with his wife. He bore a commendatory letter addressed to me which was remarkable in its ending. It said: “kindly take him under your jurisdiction for the time being and render him all the services and instructions necessary for his work.” [Emphasis added by A.L.] This distinct recognition of the Anglican Communion greatly impressed the people in the Cathedral congregation, when I read the letter to them. Both Mr and Mrs. Dorosh were by birth American citizens, and both had been trained for their work. Honolulu businessmen made provision for their support.